I’ve come to believe that we here at OCG News operate in two states – we’re either on deadline or we’re about to be on deadline. Well today, my theory was debunked. We’re in this new “not-quite-done-with-deadline” state. I know we put the paper to rest yesterday, but today has been hectic. You hear me? Valerie wasn’t in the office today, but you would have never known. If you think physically being in the another location is a reason to stop working, you thought wrong. She was cracking the whip through time and space. Somehow, Valerie has found a way to defy the Laws of Physics and be in two places at the same time. If I didn’t KNOW she wasn’t in the office, I would swear she was right here. I have to send this shout out to Emmanuel. My daughter had a 3rd birthday party a couple of weeks ago. Well, she is in LOVE with Dora the explorer. 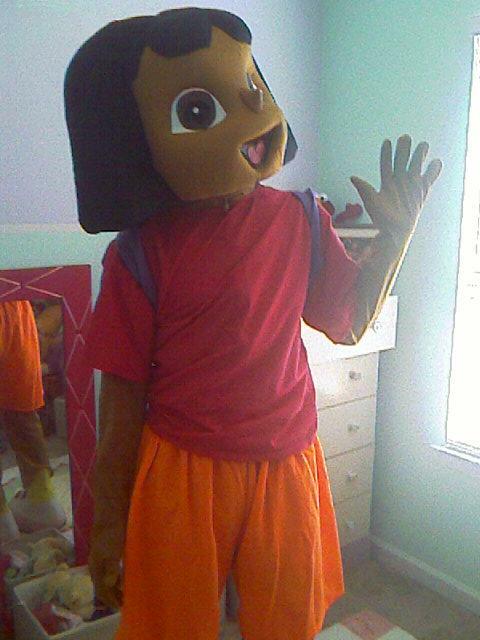 I had the great idea of renting a Dora costume on the internet. But my big problem was, who was going to get IN the costume. Mr. Emmanuel saved the day. He got “dora-fied” with no problem. I was so excited, that was until Dora actually showed up at the house and scared the gibbies out of my little girl. She cried the entire time Dora was there. I guess it didn’t help that Emmanuel is 6’2″. I don’t know if you believed me when I said we don’t know who will drop by, but it is definitely true. Grammy winning producer Kevin Bond just stopped by the office. It’s crazy. You really never know who it’s going to be. I have to be honest, he stopped by to see Glenn, who wasn’t in the office, so he only stayed a hot second. But I did get a little tid bit of information. He’s got a book coming out. It’s about ministry. I’m not sure when it will hit the streets though. I’ll keep you posted. Well, In true do-it-differently-Vernon-Jones fashion, the CEO is taking is senate campaign to new heights– literally. He has political banners flying over our heads. The latest sighting was over Georgia Dome on Monday before the Falcons Games. It’ll be interesting to see where else the sky banners pop up. Keep your eyes to the skies. Let me know if you spot one and where. By the way, do you think he has a chance of winning? And have you heard the latest about Juanita Bynum? She paid the $32,000 tax lien on her $4.2 million property. She plans to open Mt. Olive Country Spa on the property and offer pampering, prayer, and spiritual guidance. For a fee. What do you think about that? DeKalb CEO Vernon Jones thinks he has a compromise to Commissioner Jeff Rader’s proposal to shut down the county’s bars at 2 a.m. He wants to leave the hours just the way they are! He doesn’t think that is the real issue. The real issue is a public safety one. He’s drafting legislation that would have new businesses coming into DeKalb County pay a higher business fee. That money would be used to hire more code enforcement officers and police officers to tackle the problem. “Reducing the hours is not going to address any of theses issues. Let’s just give more tools and resources where they are needed,” said Jones. Jones said there was a shooting recently at Club Opera in Atlanta. Obviously, that has nothing to do with the time people stop pouring liquor, he said. What do you think about his proposal? Now although he knows things get really crazy around here on deadline, he always brings some kind of gift – drinks, a book, an autographed picture – so he can slip in and slip out without getting hurt. Uh Oh, Valerie just kicked him out. She said she can’t think about anything but deadline right now. Okay, gotta go. I’ve been working on this one story ALL DAY and I’m almost finished.